→1999MY: Check and adjust every 20,000 miles. 2000MY→: Check and adjust every 60,000 miles. Check and adjust every 60,000 miles. Injection pump locking pin – No.3359. Insert locking pin in injection pump  . Tool No.3359. Slacken injection pump sprocket bolts  . NOTE: DO NOT slacken injection pump hub nut. Ensure locking pin located correctly in injection pump  . Turn automatic tensioner pulley clockwise until notch and raised mark on tensioner aligned  . Use tool No.3387. Tighten injection pump sprocket bolts to 25 Nm  . Injection pump locking pin  . Ensure locking pin can be inserted in injection pump  . 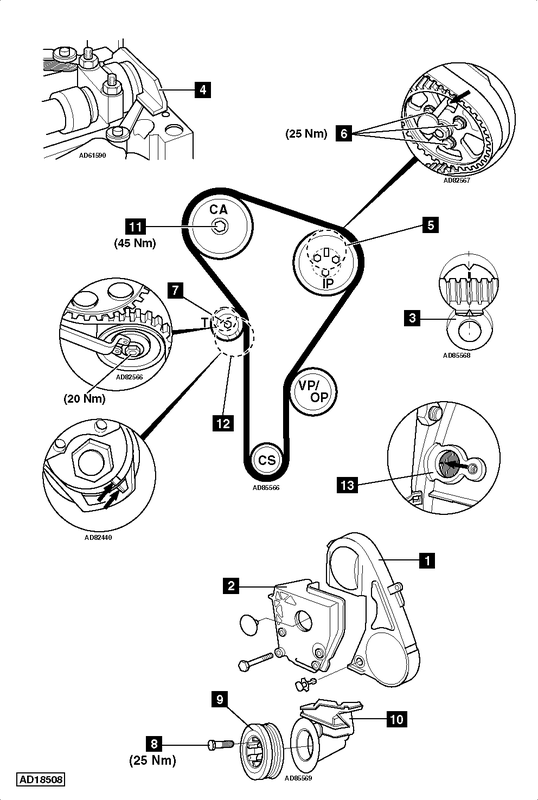 If not: Slacken injection pump sprocket bolts  . Turn sprocket hub until locking pin can be inserted. Tighten bolts to 25 Nm. Tighten crankshaft pulley bolts to 25 Nm  .